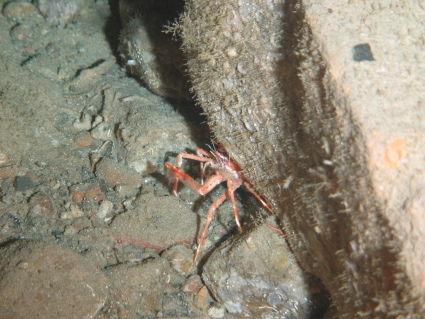 A squat lobster (Munida sp.) feeding on krill. 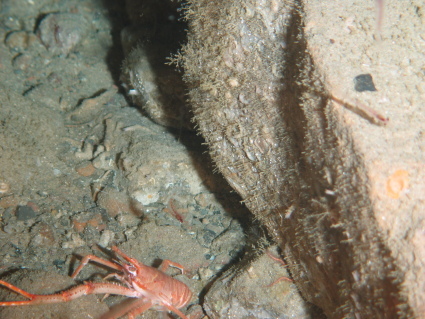 In this image the squat lobster has caught an individual krill in its claw. This behaviour has previously reported by SERPENT at the slightly deeper Scheihallion and Foinaven fields close to Lancaster. For further details see: Hudson, I. R and Wigham, B. D. (2003). 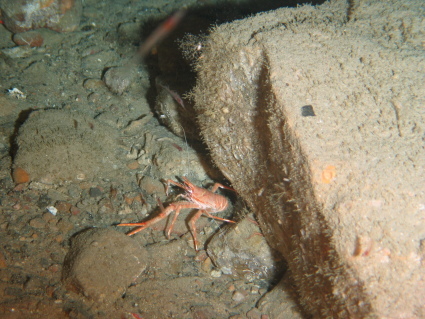 In situ observations of the predatory feeding behaviour of the galatheid squat lobster Munida sarsi using a remotely operated vehicle. Journal of the Marine Biological Association of the U.K. 83: 463-464. Found at a density of 0.02 individuals per metre squared at Lancaster.